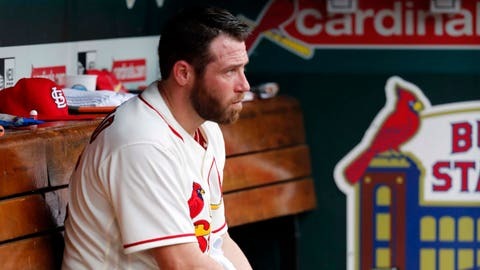 Greg Holland went 0-2 while posting a 7.92 ERA in 25 innings with the Cardinals. It appears the Greg Holland era will come to an end with the Cardinals, while reliever Tyler Lyons may have a chance to work his way back after both relievers cleared waivers on Friday. Both Holland and Lyons were designated for assignment last week as the Cardinals attempted to completely revamp their struggling bullpen. Holland, who the Cardinals thought would be their closer, struggled ever since signing a one-year, $14 million contract at the start of the regular season. Holland went 0-2 while posting a 7.92 ERA in 25 innings with the Cardinals. The three-time All-Star also spent multiple stints on the disabled list as he struggled to find his form. The #STLCards announced this afternoon that LHP Tyler Lyons cleared outright waivers and was outrighted to Memphis, and RHP Greg Holland cleared release waivers and was released. Lyons posted similar struggles this season. After a career-best 2.83 ERA last season, Lyons’ ERA ballooned to 8.64 over 16.2 innings in 2018. He’ll work to regain his form with hopes to return to the Cardinals some time this season. The 30-year-old was removed from the Cardinals’ 40-man roster.